After the uprisings in 2011, the Moroccan government promised to reinforce citizen participation – but does this really materialize today, or are these measures purely ‘cosmetic reforms’? DIE and the Moroccan Institut National de l’Aménagement et d’Urbanisme just signed a cooperation agreement and started their common research on these questions. Where and how did initiatives for citizen participation really influence policies and their implementation? What can Moroccan decision makers and development cooperation learn from these experiences? And how can the new instances for gender equality and parity, and for the integration of youth be designed and work effectively for integrating marginalized groups? Annabelle Houdret (DIE) started a new research initiative addressing these questions together with a team of Moroccan researchers in the cities of Chefchaouen, Larache, Agadir and Tiznit. 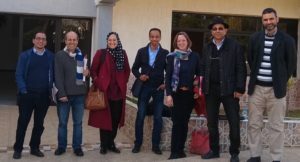 They met for the kick-off workshop in Rabat on 21 February and will present the results in early 2020.